Troublemaker Games is in their final day for their 6mm Indiegogo campaign. They've made it through all their stretch goals, so if you want in, it's a pretty good deal on the littlest of little mans. Troublemaker Games have unlocked our final stretch goal for this campaign as we head into the last 24 hours. 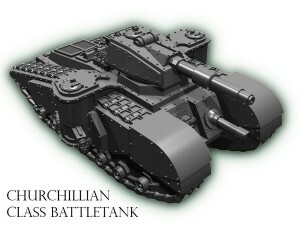 The command echelons of Tusculum Novan armies require a vehicle that is part command centre, and part mobile battle fortress. Wrapped in multiple layers of reactive armour, equipped with advanced communications and jamming technology, protected by energy shields and armed with multiple defensive weapons, the Dictum Mobile Command Centre is the heart of a Novan army at war. Some Novan commanders have been known to request some of their command centre's spacious operations room be given over to the operation of a massive automatic petard cannon and seek out direct battle aboard their massive command vehicles, although this is not standard recommended practice at the orthodox Novan war academies. The Dictum is a very large metal model kit, 5.8cm long, 3.6cm high, and 4cm wide. Troublemaker Games is showing off their War Stalkers 3D renders they've got as a stretch goal for their 6mm armies Indiegogo campaign. 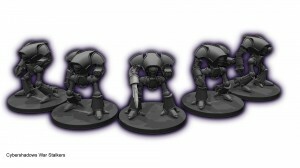 Cybershadows forces use War Stalker light mechs as part of their combat forces. Each War Stalker can wield equivalent martial capability to a platoon of infantry or medium tanks, and when operating in hunting packs only Leviathan Stalkers can hope to oppose them for concentrated combat potential. Troublemaker Games has some special Cyber Monday deals going on over in their Indiegogo campaign. Check the Perk list out for our special Cyber-Monday deals, available for one day only! To use a Cyber-Monday Deal, simply purchase the appropriate Perk, and at the end of the Crowdfunding Campaign we will email you to find out which models you want. These credit Perks are available for one day only, but can be used to pay for any Troublemaker Games 6mm scale models, including "stretch goal" models that have not yet been unlocked. Pledge £100, receive £110 of credit! Pledge £200, receive £225 of credit! Pledge £300, receive £350 of credit! Pledge £400, receive £475 of credit! Pledge £500, receive £600 of credit! Troublemaker Games launched a 2nd Indiegogo campaign for a new wave of 6mm minis. This focuses more on air power. 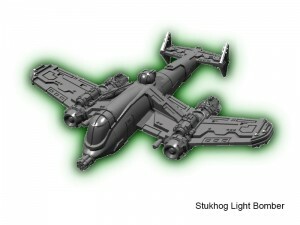 Already 30% funded, Troublemaker Games is aiming to bring more 6mm scale scifi models to life. 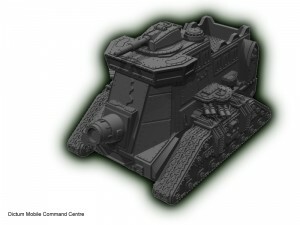 Troublemaker Games has a new 6mm Superheavy Tank available over in their webshop. They've named it the Beast. Skinnerz forces use modular super-heavy vehicles known as "beasts" in a variety of configurations. Some individual examples may be lightly armed and optimised for transport duties, whilst others may be festooned with super-heavy weaponry. 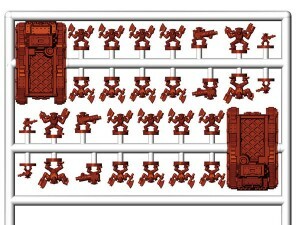 This set contains 2x metal Beast Class Super-Heavy Transports (each 6.1cm in length), plus Laser Cannon & Macro-Howitzer modular weaponry choices. Troublemaker Games keeps your littlest little mans standing with their new 6mm scale plastic bases. Brand new 25mm Diameter Plastic Bases from Troublemaker Games. 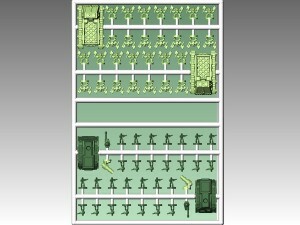 Troublemaker Games' own plastic bases, designed for 6mm scale miniatures. This set contains 80 6mm scale plastic bases. The bases can also be turned upside-down if a 25mm diameter flat circular base is required. Troublemaker Games takes to the air with the release of their new 6mm Lancastrian Bomber. Troublemaker Games are pleased to release the first metal model from their recently concluded crowdfunding campaign, the Lancastrian Bomber. Troublemaker Games is in their final couple hours over on Kickstarter. If you wanted to get in on their 6mm army campaign, now's the time. 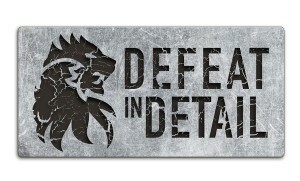 … For every pledger who has put in £30 or more, Ye shall receive a free hardcopy Defeat In Detail rulebook! …For every pledger who has put in £100 or more, Ye shall also receive two free sprues of plastic bases! Unless we don’t break £11k. Then you’ll only get the amazing models and free gifts that have already been unlocked and paid for, what a shame! Thankyou for your incredible and unexpected support everyone! Troublemaker Games posted up a new stretch goal for their 6mm scale minis campaign up on Indiegogo. The last month has amazed us at every step, we are incredibly grateful for all the incredible financial support we’ve received so far. If we hit £8000, every pledge of £45 or more will receive one free infantry & IFVs plastic sprue, and every pledge of £90 more more will receive two free plastic infantry & IFVs sprues. Troublemaker Games made it through another stretch goal over the weekend in their 6mm Indiegogo campaign. They've posted up a big update about what's available now. Here comes our biggest campaign update to date! First of all, we’d just like to say thankyou for your continued support, without your financial backing this project would have failed at the first hurdle, and for that vote of confidence we can only be grateful. 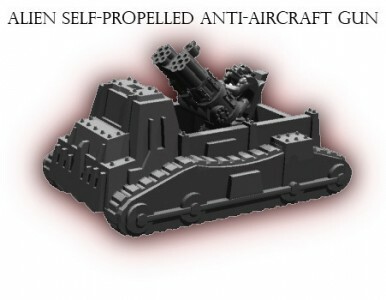 Troublemaker Games has added new anti-aircraft vehicles to their 6mm Scale Armies Indiegogo campaign. Our new product addition for today is a self-propelled Anti-Aircraft Vehicles set, which is available to pre-order now. 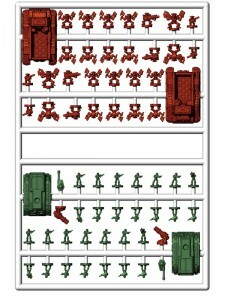 This set will contain two plastic infantry & IFV’s sprues, enough plastic bases for the plastic infantry, and enough metal components to build four Alien Anti-Aircraft vehicles and four Human Anti-Aircraft vehicles. We’re currently firming up what our next major stretch goal funding level will be, but in the mean time any profits that accrue will be diverted into funding improvements to the plastic sprue… stay tuned! Troublemaker Games made it past their first stretch goal over on Indiegogo for their 6mm armies campaign. We’ve made it past £3500, so the Advanced Plastic Sprue is Funded! But in practical terms, what does that mean?! Well for starters, it means everyone who’s pledged for the 6mm scale Plastic Armies Boxes is now going to be receiving 20% more models, for free! Troublemaker Games has made it over their funding goal over on Indiegogo (Woot!) and they've posted up their stretch goal they hope to surpass next. Wow, what a crazy 24 hours! 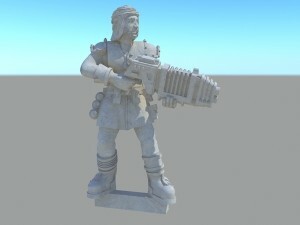 This is a huge moment for us, to know that the first 6mm scale plastic scifi infantry models to be released in over a decade will be hitting the shelves in the not-too-distant future is simply amazing, and it’s humbling to us to know that you (the community) have chosen to get behind us in our dream to bring brand new tiny man-barbies to your gaming tables. Thankyou everyone, for your trust and your confidence. We will do this for you. Now, let’s chase down the Advanced version of the sprue, where everyone who’s already paid-in gets 20% more models for no extra cost! Troublemaker Games has launched an Indiegogo campaign in order to fund a new line of 6mm miniatures. 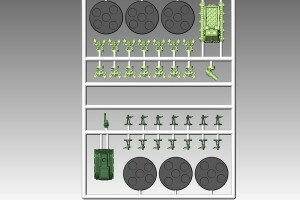 We're looking to produce some new 6mm scifi army plastic sprues. Troublemaker Games has launched an Indiegogo campaign in order to fund a line of sci-fi light infantry. Go check it out. Troublemaker Games have designed our first 28mm scale project, a modular arabian-themed science fiction light infantry set, and with your help, they can become real tiny "man-barbies" (as my wife loves to call them)! The initial £600 goal is to fund just the riflemen, but if we raise enough backing we'll do leaders, a variety of squad support weaponry, and specialist types such as artillery crew, medics, etc. 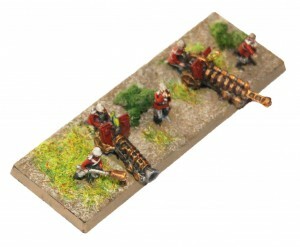 Troublemaker Games brings some firepower to the battlefield with the release of their new British Field Guns. The standard issue Field Guns employed by the British Army are the Amplified Coherent Light Collimator, and the Sonic Carronade. The former is a directed beam energy weapon of arcane scientific manufacture, which projects a flashing beam of light that pierces armour with ease, whilst the latter is essentially a scaled up version of the Sonic Blunderbusses issued to British Line Infantry that shares a analogous anti-infantry role on the battlefield. As with most machines of the 1870’s Field Guns are steam-powered and semi-autonomous, capable of continuous high rates of fire and limited propulsion just so long as their ammunition and compacted coal supply hold out. Each Field Gun squad generally consists of two gunners, two loaders, and a sergeant to oversee both fire teams under his command and ensure that their weaponry is employed against the correct target. This set contains 12 Amplified Coherent Light Collimators, 12 Sonic Carronades, 36 gun crew and 12 Troublemaker Games Plastic Bases. Troublemaker Games has their eyes to the skies with their latest Timeline 300 release: Martian Flying Machine. 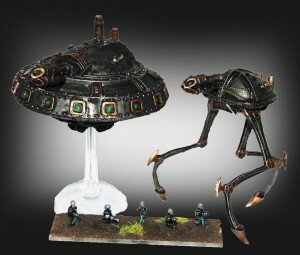 Troublemaker Games are pleased to announce our latest release for TIMELINE 300, the MARTIAN FLYING MACHINE. Heavier than air flight of objects larger than a human being has not been achieved by Earthlings, and so the sight of a Martian Flying Machine soaring through the sky is one that terrifies those humans who are unfortunate enough to observe one in flight. Equipped not just with a short range chemical weapon system that suffocates its targets, the Flying Machine also carries an Aetherical Translocator that allows it to bring new Martians onto the battlefield which can close to finish off those left alive after the black smoke clears. It is a horrific dual threat which is becoming increasingly more common on the battlefields. This pack contains one Martian Flying Machine, as well as a clear plastic flying stand. Note that this model is produced in Resin, and may contain some small air bubbles. Troublemaker Games has released new German Armored Infantry for their Timeline 300 game (you know, the one with the contest going on). New release from Timeline 300, German Armoured Infantry. 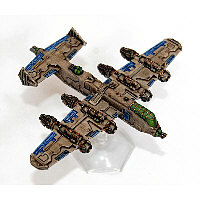 60x 2 part infantry models, plus 12 Troublemaker Games plastic bases, are £12. Timeline 300 is a 10mm scale Victorian Scifi / Steampunk wargame, featuring a unique RTS resource management style rules system. Troublemaker Games needs some art for their Timeline 300 rulebook and they're hoping you can help out. More specifically, it needs your art skills, for the Timeline 300 rulebook! The overall winning entrant (which will be chosen by a public vote on our Facebook page, will receive any metal blister pack or resin super-heavy vehicle of her (or his) choice from the Timeline 300 model range. Troublemaker Games has released their new British Heavy Cruiser for Timeline 300. No worries about it hitting ice bergs, though... but maybe a glacier. Troublemaker Games have released a British Heavy Land Cruiser, their first resin kit for their 10mm scale Steampunk game, Timeline 300. This 16cm long super-heavy vehicle is armed with a Tesla weapon and Heavy ordinance guns, and comes with 5 metal crew models. Troublemaker Games has a bunch of new releases for their Timeline 300 game. New releases today from Troublemaker Games for the 10mm scale wargame Timeline 300. And finally, our rulebook is now going into Open Beta. Our high quality miniatures, designed by acclaimed sculptors Ben and Barny Skinner, are designed on computer, allowing for the highest possible level of detail. We don't just make models though; we make games. Our first game is Timeline 300, a 10mm scale Steampunk wargame, set in an alternate version of the year 1870. Great Britain and Germany, supported by steam-powered technology and the magic of Thaumatic energy, fight for dominance of the only resource that matters, coal, all under the hungry gaze of the approaching Martians. Unlike many wargames, Timeline 300 is not played by buying two equally pointed armies, lining them up and fighting. Instead, the game is more about the capture of resources which allow the purchase of new forces during the game. Battles can start small and develop into vast conflicts, as the fight for control of the flow of coal intensifies.